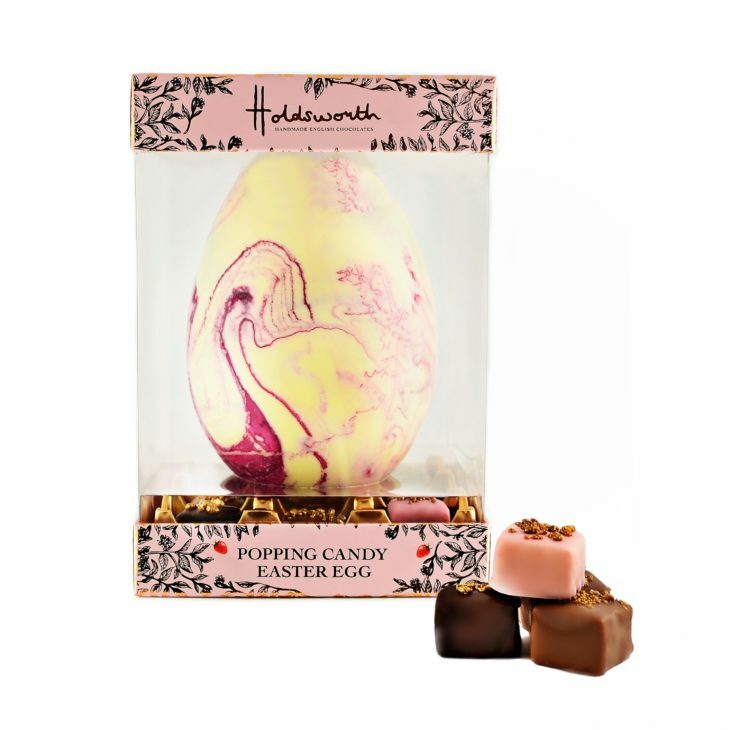 Holdsworth Chocolates brand new Easter creation! 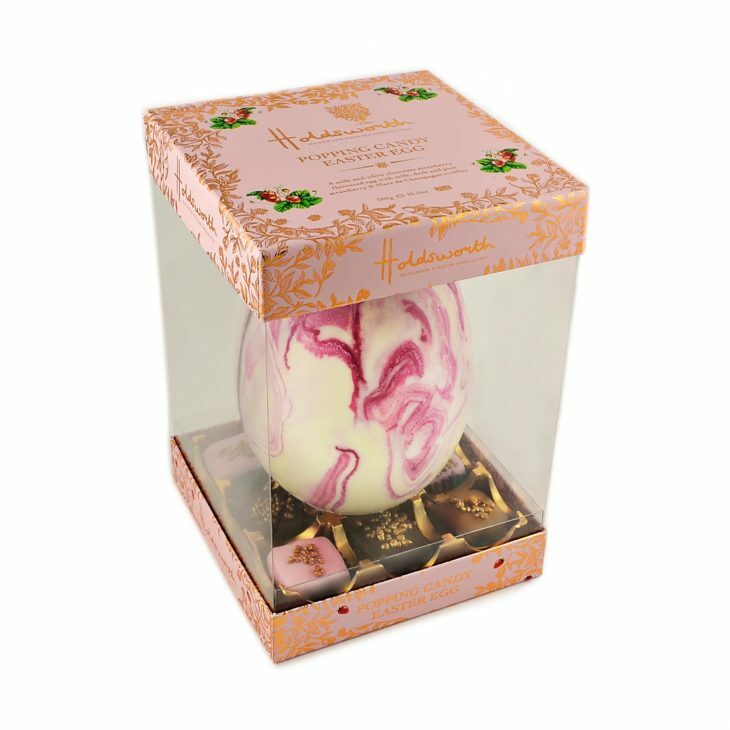 Featuring Milk Chocolate Strawberry with Popping candy egg with truffles. A marbled Pink and white Easter egg, infused with fresh strawberry and crispy popping candy. Nestled above our Strawberry and Marc de Champagne truffles with popping candy, this egg is a boozy delight. If you are looking for a tasty treat for the kids, we have Edward the Egghog and Eggy Egg & Spoon – click to view. Ingredients: Milk Chocolate 59% (Sugar, Cocoa Butter, Whole Milk Powder, Cocoa Mass, Emulsifier: Soya Lecithin, Natural Vanilla), White Chocolate 25% (Sugar, Cocoa Butter, Whole Milk Powder, Emulsifier: Soya Lecithin, Natural Vanilla), Popping Candy 4% (Sugar, Cocoa Butter, Lactose, Skimmed Milk Powder, Cocoa Paste, Glucose (Corn), Anhydrous Butter, Emulsifier: Soy Lecithin (E322), Vanilla, Natural Flavours, Preservative: Carbon Dioxide (E290)), Butter 2% (Milk), Fondant 2% (Sugar, Glucose (Wheat), Water, Preservative: Sulphur Dioxide), Alcohol (Marc de Champagne 2%), Colour (Beetroot Liquid 1 %), Fruit Purees (Glucose Syrup (Wheat), Invert Sugar Syrup, Strawberries 1%, Beetroot Juice Concentrate, Natural Flavouring, Ethanol, Acidifier: Citric Acid, Colouring Plant Concentrates ( Apple, Safflower, Lemon)), Dark Chocolate 1% (Cocoa Mass, Sugar, Cocoa Butter, Emulsifier: Soya Lecithin, Natural Vanilla), Natural Flavouring: Strawberry 0.2%, Colour (Titanium Dioxide, Iron Oxide ), Raspberries, Strawberries 0.1%, Citric Acid .